BlackBerry has unveiled a new smartphone that has a distinctly old-school feel. The BlackBerry Classic, announced Wednesday, has all the old BlackBerry (BBRY) staples, including a trackpad, navigation keys, and a physical keyboard. But it has an updated look, a bigger screen, and it runs BlackBerry's latest BlackBerry 10 operating system. 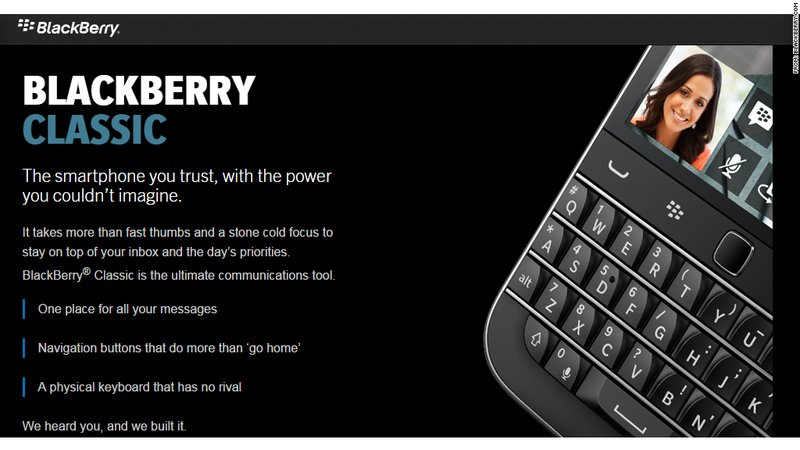 Essentially, it's a slightly more modern take on the BlackBerry Curve or BlackBerry Bold from several years ago. "If it ain't broke don't fix it," said BlackBerry CEO John Chen in a company blog post. "BlackBerry Classic reflects that." Even as BlackBerry says that it's shifting focus away from its poor-selling devices, there remains a passionate, core group of customers that love their "CrackBerries" -- a group that includes some very vocal supporters like Kim Kardashian. But BlackBerry's product lineup has evolved in recent years, gaining touch screens and other bells and whistles that try to mimic the iPhone and Android smartphones. Some BlackBerry devices have delved into the truly outlandish, including the giant, square BlackBerry Passport and the $1,950 P'9983 smartphone designed by Porsche. On Wednesday, BlackBerry acknowledged that those phones aren't for everybody -- particularly longstanding BlackBerry fans. "Sure, we've got new BlackBerry devices that break the mold, including the BlackBerry Passport," Chen said. "But we also recognize that a lot of you continue to hang on to your Bold devices because they get the job done."